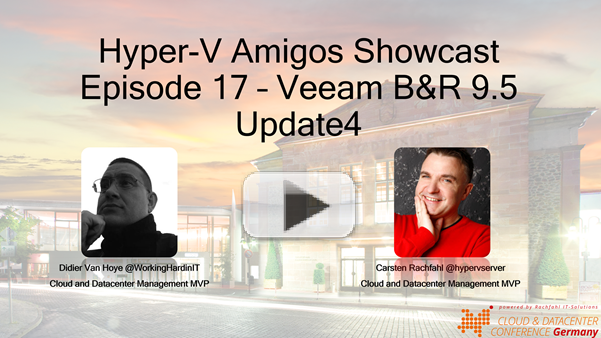 While we, the Hyper-V amigos (Carsten Rachfahl and Didier Van Hoye) are updating on of their labs from Veeam backup & Recovery 9.5 Update 3 to Update 4 we talk about what’s new in this release. We don’t succeed in covering it all, let alone to do so in detail. There is just too much in this release. The upgrade itself goes smooth as silk, which is what we have become to expect from Veeam. Not that we were confused a moment when ze couldn’t disable the jobs prior to the upgrade, well they were not scheduled in the lab. We have future plans to do some demos of new capabilities like support for object based storage, Veeam Agent for Windows 3.0 etc. We have started testing this feature already with a Minio Docker container on a Synology. Pay attention to the Unofficial object storage compatibility list for Capacity Tier as we also noticed that the Windows service seems to have scalability issues. We’ll be taking a look at this in the future. What was possible in Azure is now extended to more use cases. This make perfect sense as the market is diverse and you have to serve all the customers. Imagine moving very easily VMs between on-premises and different cloud solutions as the conversion details are handled for you. Any tool that can help be more compliant and secure is a good one. Helping you be GDPR compliant for example or helping you protect restores form introducing ransom ware are prime examples of this. This is another feature we’ll look at. When you use the Oracle or SAP HANA you will appreciate the fact that these can be protected by Veeam. Is this a big want? Yes. Sure, not by me personally, but it is a big deal to many customers. Let me tell you that I once met an IT director that would be trilled if Veeam would protect AS400. Needs differ. Self service is important to organizations that offer data protection, availability and mobility to external or internal customers. It helps optimize the process for all parties involved. Well this is a Veeam One feature actually. Any sizable support organization has tooling to collect and parse logs in order to get to the (root) causes of issues as soon as possible. They have to in order to scale support. If not, they’d drown in work and need too many people to make if feasible and have anything close to excellent support that solves issues within a reasonable amount of time. I don’t know many that are sharing the capabilities of their tooling with their customers. This makes me think Veeam must be pretty confident in the quality of the tooling to do so. I’m curious to hear the feedback on how much it helped customers and as such Veeam support. of Veeam Backup & Replication and all of its remote components, and for backup with Veeam Agent for Microsoft Windows. support as guest virtual machines, for installation of Veeam Backup & Replication and all of its remote components, and for backup with Veeam Agent for Microsoft Windows. Microsoft Windows Server Hyper-V 2019 support as a hypervisor host, including support for virtual hardware version 9.0v virtual machines. Microsoft Active Directory 2019, Exchange 2019 and SharePoint 2019 support for application-aware processing, and for item level recoveries with Veeam Explorer. Oracle Database 18c support for application-aware processing on Windows-based virtual machines, including transaction log backup and point-in-time restores. VMware vSphere 6.7 U1 ESXi, vCenter Server and vCenter Server Appliance (VCSA) support. VMware vCloud Director 9.5 support. Veeam keeps building a strong ecosystem of partners to give customers the ability to protect their data in more ways than they could easily or cost effectively deal with by themselves. We have enhancements and additions to the product for both backup and restore functionality, 3rd party integration, the Veeam Agents, the explorers etc. You can read it all for yourself right here: What’s New in 9.5 Update 4? While you’re doing some routine maintenance or getting some labs setup, you’re very welcome to kick of the show cast. You’ll be joined by two tired (recovering from colds) IT Pro’s while they do a fast and successful update of a Veeam lab environment so we can demo so new capabilities in the future. 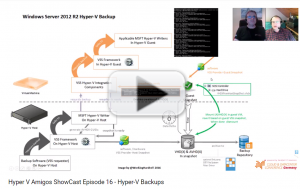 In this Episode Didier and Carsten talk about the Backup Improvements in Hyper-V over the past releases. Didier use some very impressive visuals to explain the hole backup process including VSS Snapshots, SAN Snapshots, Change Block Tracking and so on. But this wouldn't be a Showcast if there weren’t a lot of Demos. Have fun watching this one. To watch the Showcast click on the picture below or here. 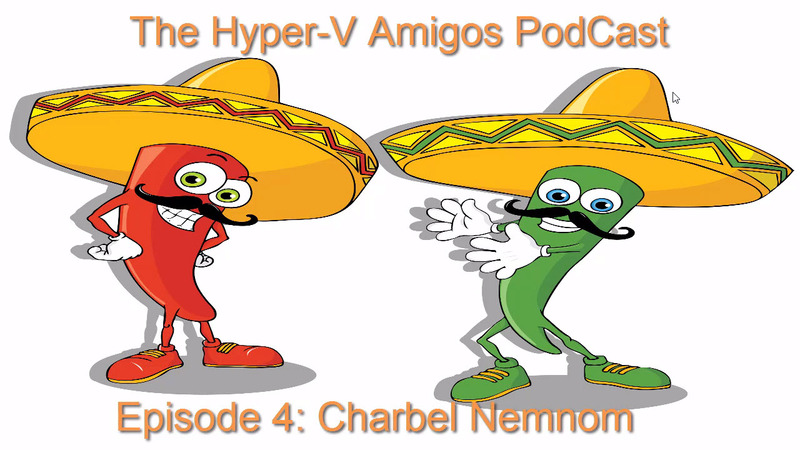 In this Episode Carsten talkes with Charbel Nemnom Microsoft Cloud & Datacenter Management MVP like himself. Charbel is Co-Author of the Book Windows Server 2016 Hyper-V Cookbook and Carsten ask Charbel alot of questions about the book. We hope you enjoy the video. In this Episode Didier and Carsten talk about Enhancements in Remote Graphics: RemoteFX and Discrete Device Assignment. DDA allows the Administrator to assign a PCI device like an GPU exclusively to an VM. So watch this Showcast and lear all about it. In this Podcast Carsten ﻿﻿﻿﻿﻿﻿﻿talkes﻿﻿﻿﻿﻿﻿﻿ with Alessandro Pilotti also an Hyper-V MVP. Alessandro is a real OpenSource fan and so it haped that he started integrating Hyper-V and Windows Technologies into OpenStack. 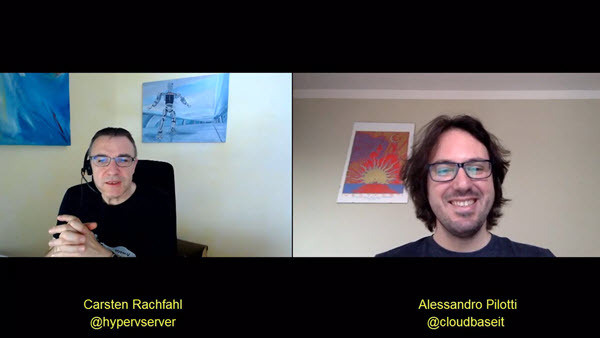 Listen to Alessandro and Carsten about the great stuff he and his Company Cloudbase Solutions is doing here. In this Episode, I talk with one of the original Hyper-V Amigos Hans Vredevoort about Azure Stack. Hans is a long-time MVP and has done allot of work with Windows Azure Pack and now with Azure Stack. Hans gives some hints about the Azure Stack TP2 one Node deployment and shows us a bit around in the Portal. Enjoy the interview and demo. In this Episode Didier and I look at a single host deployment with Storage Spaces on Windows Server 2016. We create a “Hybrid” disk just like in Storage Spaces Direct by combining SSD & HDD in a storage Tier. We were very happy to discover that ReFSv3.1 does real time tiering. We’re very excited about this because we want to leverage the benefits if Veeam Backup & Replication 9.5 brings by leveraging ReFSv3.1 (Block Cloning) in regards to backup transformation actions and Grandfather-Father-Son (GFS) spaces savings. To do so we’re looking at our options to get these benefits and capabilities leveraging affordable yet performant storage for our backup targets. S2D is one such option but might be cost prohibitive or overkill in certain environments. ReFS v3.1 on non-clustered Windows Server 2016 hosts bring us integrity streaming, file corruption repair with instant recovery as protection against bit rot, the performance of tiered storage and SMB3 as a backup target at a great price point. But please watch the video and see for yourself. In this Showcast Didier and Carsten are playing with a Hyper-converged Storage Spaces Direct System with Windows Server 2016 installed. The show some crazsy performance numbers and even turn 2 of the 4 nodes off. While playing with the Cluster we see also some new Features like Distributed Storage QoS, Cluster and VM Isolation and Cluster Fairshare. See what’s happening, bring some time the show is a bit lengthy and enjoy the video. 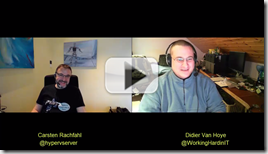 In this Episode Didier and I talk about some of the cool Failover Cluster improvements in Windows Server 2016 that Didier will present at the Cloud & Datacenter Conference Germany in May. We also talk a bit about that Conference and the Speaker Lineup that is in Didier words amazing. After that we tell you about an experience we both share that was truly mind blowing. 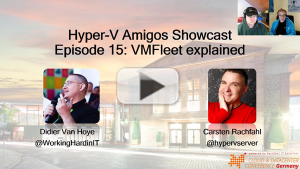 I hope you have fun with this Episode of the Hyper-V Amigos Showcast.